Travellers on Bolivia’s ‘Death Road’ are given a stark visual warning about why the mountainous gravel pass is considered one of the world’s most dangerous supply routes: hundreds of crosses line the track to commemorate the frequent fatalities. 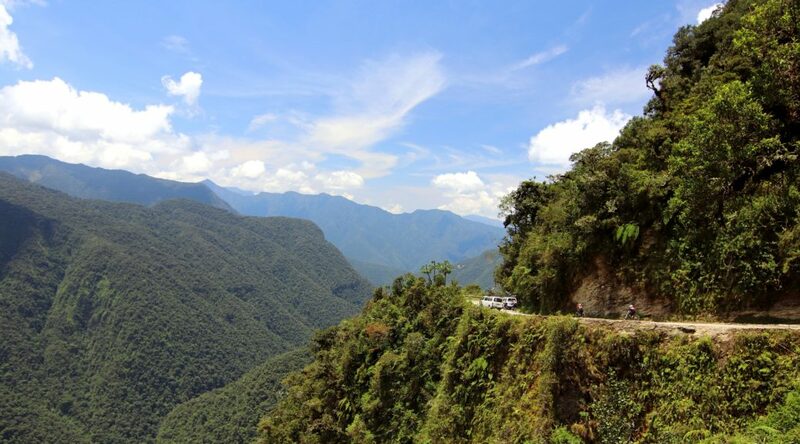 Formally known as La Cerretera de los Yungas, the vertigo-inducing path was once notorious for claiming the lives of up to 300 travellers a year as their cars, trucks and even buses careened over the unprotected roadside and down sheer 1000-metre cliffs. In July 1983 a bus fell into a canyon, killing all 100 people aboard, while in 1999 eight Israeli travellers died when their vehicle did likewise. Judging by the pictures and YouTube clips of what can only be described as a “glorified goat track”, it’s a wonder the death toll has not been even higher. 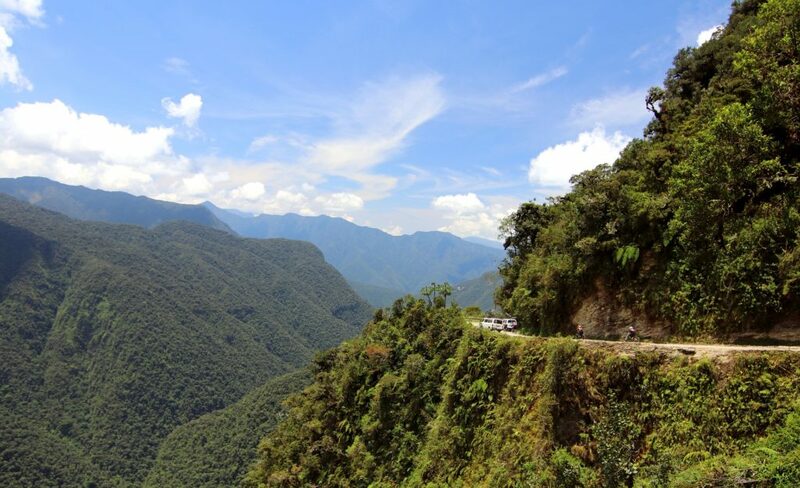 Also known as the North Yungas Road, the conduit stretches 69 kilometres up jungle-clad mountains between the Bolivian capital of La Paz and Coroico, in the Amazonian Yungas region. The road was built by Paraguayan prisoners of war during the three-year Chaco War in the early 1930s to facilitate a military supply chain linking the Bolivian Amazon to the capital. The miserable living conditions of the construction crews set the tone for locals forced to use the supply route to transport crops, timber and materials to and from La Paz for the next eight decades. Navigating the jungle-clad La Cumbre mountain pass, the twisting and turning road climbs as high as 4650 metres before descending a winding 54 kilometres to 1200 metres (the world’s longest uninterrupted downward stretch). As a wise precaution, motorists are known to pray before embarking on the route. In 1995, the Inter-American Development Bank described Yungas Road as the world’s most dangerous – no mean feat given the glorified goat tracks in regions such as the Himalayas. The road is so dangerous that, unlike in the rest of the country, vehicles drive on the left so that the driver has a clearer view of the positioning of the wheels on the crumbling roadside. In the wet season, the single lane road is made even more hazardous by mud, fog, rockfalls and landslides. Waterfalls are known to cascade across the road, taking much of the gravel with them. In the dry season, choking dust reduces visibility to metres. Wisely, vehicles travelling downhill need to give way to ascending ones, as this forces them to slow down. In the early 2000s the road was given an upgrade of sorts, with two driving lanes, proper asphalt and protective barriers. But judging by recent photos, it’s still not exactly autobahn-quality. The puzzling element is why anyone would continue to use it – apart from intrepid cyclists who have spawned a whole new industry. That’s because the Bolivian government completed a new nearby road in 2009 which, while mountainous, is more in line with western standards. A 2013 clip from the UK motoring show Top Gear gives a good picture of the type of traffic encountered. Despite this safer alternative, the road remains popular as a supply route for locals, as tarpaulined trucks and even petrol tankers compete for space with buses and four-wheel-drives. Host Jeremy Clarkson also gives a near fatal lesson in overtaking procedure, as his Range Rover comes perilously close to departing the road. The footage might be edited for dramatic effect, but Clarkson’s manner suggests he is in genuine fear of producing his very last show. While the Yungas Road may no longer be the mandatory conduit between La Paz and Coroico, the adventure cycling business trades off its grim appeal. It’s estimated that at least 20,000 extreme pedal-pushers brave the route every year, which exacerbates the dangers for all road users. While most return home with tall tales and an ‘I Survived Death Road’ T-shirt, at least 20 cyclists have thought to have been killed on their road in the last two decades (exact numbers are unknown). As might be expected, a thriving cycling tour guide industry has evolved, with a commensurate rise in four-wheeled transport for equipment and supplies to service the expeditions. Intrepid cyclists are well advised to pick their tour operator carefully. As Australian journalist and Yungas cyclist Andrew Fenton writes, even the mid-range ones leave much to be desired. “At one point the guide lines us up on our bikes at the edge of the cliff for a photo, and jokes: ‘OK, now everybody take a step back’! While La Cerretera de los Yungas’ Death Road cachet endures, adrenalin-seeking westerners may be heading to the wrong country: the Dangerous Roads site dubs an obscure Turkish pass called Bayburt Of Yolu-D915 as “probably more dangerous” than the Bolivian road. Climbing to 2300 metres above sea level, the 105 kilometre road navigates 28 hairpin turns, linking Of and Bayburt in the country’s east. It’s a working road used by locals driving anything from trucks to motorbikes – and a highway to hell for the careless and impatient – or plain unlucky.